Four people and the attacker, Khalid Masood, had died as he drove a car at high speed down the bridge before stabbing a Scotland Yard officer to death at the gates of Parliament. 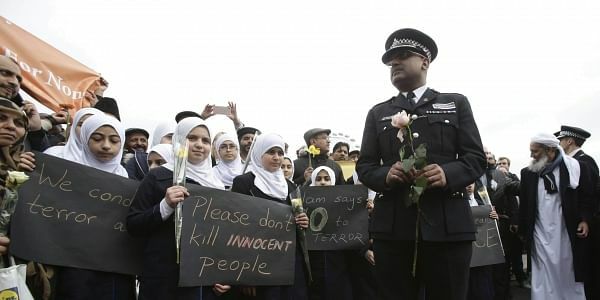 LONDON: Members of a Muslim organisation and British police officers were among hundreds of people gathered on Westminster Bridge today, the site of the London terror strike last week, to pay tribute to the victims of the attack. Four people and the attacker, Khalid Masood, died as he drove a car at high speed down the bridge before stabbing a Scotland Yard officer to death at the gates of Parliament. The Metropolitan Police Federation said people linked hands across the bridge from the south to the north at 14:40 local time - the time the attack began. Similar events were staged in Sheffield, Birmingham, Leeds, Leicester and Manchester. Inquests into the victims' deaths were opened and adjourned at Westminster Coroner's Court earlier today. Senior coroner Dr Fiona Wilcox said it was a tragic incident. Senior investigating officer Supt John Crossley said Masood was armed with two knives and caused grave wounds when he attacked police constable Keith Palmer. The inquest into Masood's death will be opened and adjourned tomorrow.